Finn has been totally swept away by the fun at Feedback School of Music! 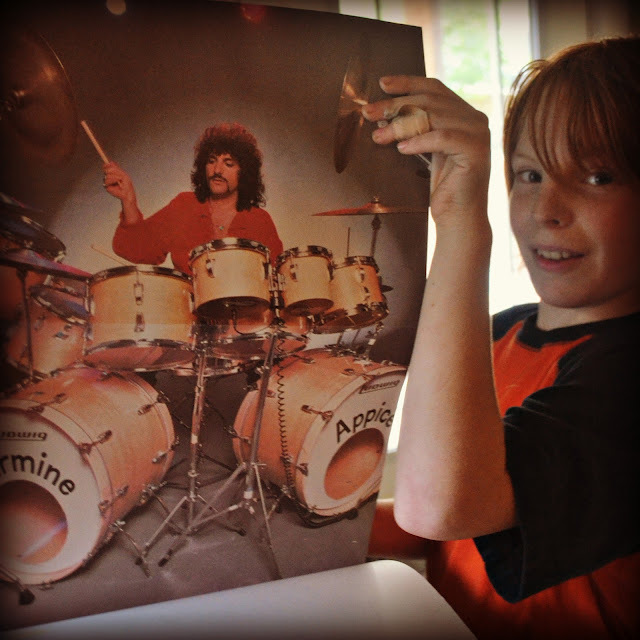 He started playing drums about two months ago and yesterday they surprised him with a new music book. Finn was thrilled to show off the "old fashioned 54 record" that came with the book (I didn't have the heart to tell him it was a actually called a 45) In addition to the book, the school director, Midge, surprised Finn by organizing a jam session with a real working musician (Jim Dinou) in lieu of his regular lesson. Finn admitted to being a little nervous (it was his first time playing with a full kit), but had a marvelous time hanging with Jim and really appreciated his constructive criticism and well...feedback. This video captures their first moments playing together; according to both Midge and Finn they only got better with time. I think we are going to need to seek suggestions from the drummers in our life about purchasing a drum kit for the Finnman. It seems to me that he is more than a little hooked!